Home » About Sugars » Dessert Entry Permits ! Whether you are a diabetic, or watching your weight, or just concerned about the quantities of sugar or processed flour you consume, you can use the Dessert Entry Permit concept to help you decide when to indulge. Desserts: All of them clamour to be let in. All of them will parade past you at different points in time. All of them seem attractive. However, all of them are not created equal, and all of them need not be allowed entry into your system! You are the officer at the checkpoint. You get to decide which dessert you will let in, and how much, and when. 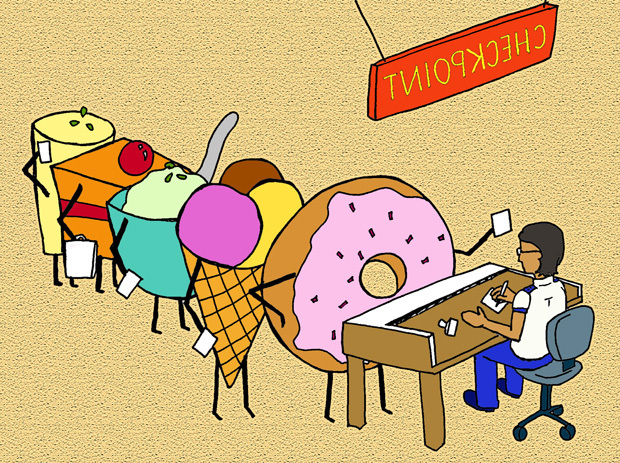 The idea of Dessert Entry Permits is inspired by Rujuta Diwekar’s concept of a Sweet Visa. In her book Women & the Weight Loss Tamasha, Rujuta talks about how we need to be like a strict nation (like the US) and restrict the number of entry visas that we allow for sweets in each year! Continuing with that idea, I’ve put together a list of factors for you to consider when you have to evaluate a dessert’s application for entry! Main Component: Favour desserts that are made largely from proteins or vegetables. This ensures lower intake of carbohydrate and a smaller impact on your blood sugars. Desserts made from whole grains are next in priority since they have some fibre to slow the digestion of the carbohydrate in them. Those made from refined flour or refined grains are on the lowest rung as they have the highest carbohydrate content and no fibre to slow down digestion. Sweetening Component: Favour desserts made using dates, jaggery, or other less refined sweeteners over desserts made out of refined sugars. The more refined the sugar, the easier it is to digest and the greater the spike in your blood sugar levels. However, do remember that ingredients like jaggery, dates, and agave while better in terms of nutrients and fibre content, are ultimately sugars having high glycemic indices, and you will need to restrict the amount you consume, especially if you are diabetic. Diabetics can consider occasional permits for desserts made with sugar substitutes (such as stevia, levulose, sucralose, xylitol) that have either very low or zero calories and lower impact on blood sugar levels. Quality: Favour well-made desserts from reputable sources! Desserts that are homemade or freshly made at bakeries and stores tend not to have preservatives or added flavouring agents. Quantity: Favour smaller portions! Yes, size discrimination is encouraged at this checkpoint! Time: Favour applications made a few hours after your previous meal to allow time for your blood sugars to stabilise before you permit entry of the dessert. Love: Favour small portions of desserts that are your absolute favourites, and you won’t feel as bad about rejecting the rest! Choose wisely! Be ruthless! Protect your blood sugar levels! Very well written and informative post. Sharing this with my friends on FB – if you don’t mind. I love this post..very nicely written. And yes, these checks and balances are important, thanks for the reminder. Great advice Priya – and delivered with such good humour too. Excellent! I love this post Priya!! I’ve been successful, for the most part, with eating healthier over the past two years, but I still struggle with my overconsumption of desserts. I eat them less often than I used to, but I still overindulge whenever a dessert is put in front of me. Because of this, I’m concerned about the upcoming holiday season and how I’m going to deal with all the goodies. I love your idea here, however! I think this will help me!! Celeste 🙂 PS – I also love the visual! 😀😀 A great informative post, my friend.